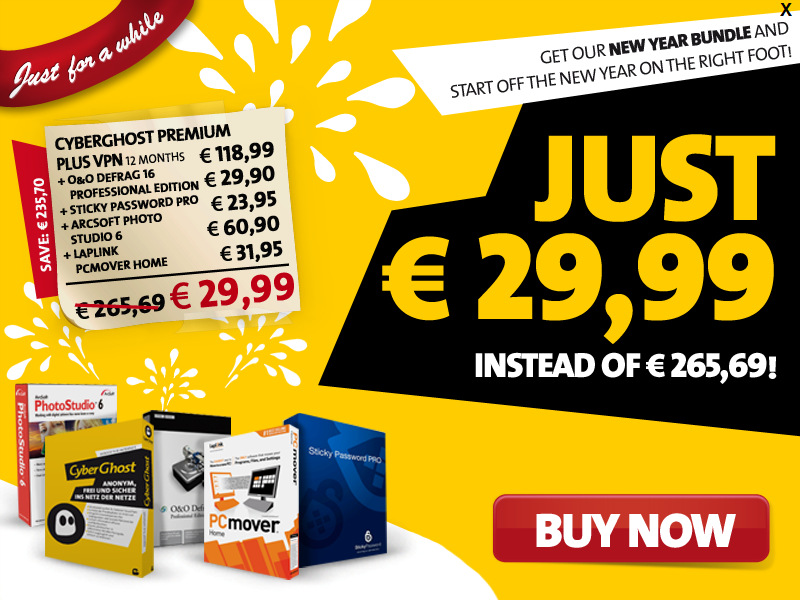 CyberGhost Winter Bundle is a 5-in-one pack that comprises of CyberGhost Premium Plus VPN 12 Months ($159.99 ), ArcSoft PhotoStudio 6 ($79.99), O&O Defrag 16 Professional Edition ($29.95), Sticky Password PRO ($29.99) and LapLink PC Mover Home ($39.95). CyberGhost Premium Plus VPN can help you to stay anonymous in internet. ArcSoft PhotoStudio 6 is powerful photo editing software featuring an array of advanced tools, filters and special effects inside a very friendly user interface. O&O Defrag 16 Professional help you to optimize hard disks with efficient disk defragmentation. Sticky Password PRO is an efficient password manager and form filler. LapLink PC Mover Home helps you to moves installed programs, files, and settings automatically to your new PC. CyberGhost Winter Bundle will suite your various needs. CyberGhost is an important tool for protecting your privacy. CyberGhost VPN replaces the externally visible IP address, which users have received from their provider when they dial up to connect to the Internet, with a CyberGhost VPN IP address. The CyberGhost user shares this IP address with a number of other users. This procedure ensures that the CyberGhost VPN IP address should not be assigned to one particular CyberGhost VPN user. Communication between the CyberGhost VPN user’s computer and the anonymization servers is also particularly well protected to prevent any eavesdropping on data transfers. This protection is set up in 2 steps when establishing the connection. 1024-bit SSL encryption is used when establishing the connection. In this case, a 128-bit AES key is negotiated, which is unique for each connection. The actual communication takes place via this AES key. ArcSoft PhotoStudio 6 is a powerful and feature-rich image editor. Beginners will appreciate the straight-forward design, while advanced users will love the performance and control. The program includes everything you need to manage, enhance, print, and get creative with your digital photos! Do not wait too long! If you work on computers a lot, then slow system and program starts, endless rendering and memory processes, or even system crashes when playing can quickly ruin your enjoyment. Defragmenting your PC can hugely accelerate the speed you can work on your PC. When you defragment, those files fragmented across the hard disk are logically rearranged so that files can be quickly recognized and processed by the hardware. Performance gains of up to 100% are not uncommon! In the new version of O&O Defrag, you can now see what the program does for your system thanks to graphics and statistics, which give you a before-and-after Defrag contrast! PCmover Home automatically moves all the programs, files and settings you select from your old PC to your new one and all of your applications will be installed automatically ready to use. It offers the easiest way to move into a new PC without leaving anything behind and works with almost any version of Windows. You can even use PCmover to transfer your PC to an Intel-based Mac using VMware Fusion, Parallels or Bootcamp. No trial is available for CyberGhost Winter Bundle but individual softwares can be downloaded separately. CyberGhost Winter Bundle costs 339.87 USD and can be purchased using This link. Use Coupon Code: VMX-345-2EU or use This Link to Purchase.